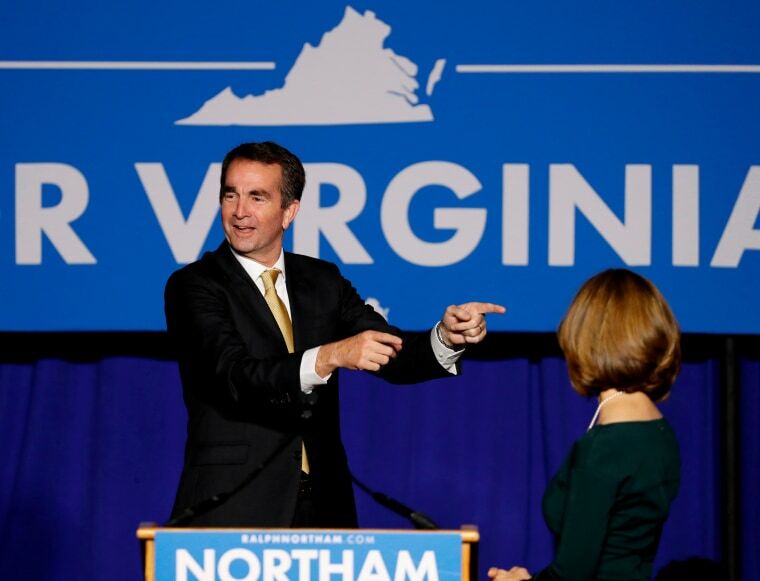 The Democratic Party’s big wins in Virginia this week, from the governor’s race on down, have sparked intense if somewhat predictable reactions from the nation’s two major political parties. Democrats are hailing Governor-elect Ralph Northam’s win as evidence of an electorate that has turned decidedly against President Donald Trump, buoying their chances for success in the 2018 midterms. Not so fast, say Republicans, who note that Virginia is just one state and those midterms are still a year away. The data behind the race suggest both sides may have a point, but the numbers, in this case, indicate there are some real warning signs for the GOP in the Virginia results. The GOP’s strongest critique against using the Virginia results as a stand-in for national trends: the state simply is not good territory for Republicans. The state has gone Democratic in each of the last three presidential elections and, with Northam’s election, four of the last five governors have been Democrats. In 2016 Virginia voted for Hillary Clinton even as Trump won the White House. So you can call Virginia “purple” if you want, but it’s moving toward the bluer end of the color spectrum. The second point is what might be called the Virginia Rule. Going back to the 1970s, the easiest way to predict the Virginia governor’s race has been to look at who’s in the White House and pick the other side. Since 1977 the commonwealth elected a governor who was of the opposite party of whoever won the presidential race in the previous year. That’s 10 of 11 gubernatorial races. In other words, with Trump in the White House, it was the Democrats' turn to win. The only exception to the Virginia Rule came in 2013, when Democrat Terry McAuliffe won. But that would only seem to prove that the state is indeed drifting to become bluer. The third point is that Ed Gillespie was an imperfect messenger in the Trump era. Only three years ago, Gillespie ran for a U.S. Senate seat in Virginia as a moderate Republican and lost by less than a percentage point. In 2017, Gillespie took on some of the president’s populist rhetoric on immigration and Civil War monuments because he had to, but it was never a good fit. Essentially, Gillespie tried to split the difference between campaigning as Trump supporter and as more of a moderate. That wasn’t enough for loyal Trump voters — or at least that’s the view of some Trump supporters, including alt-right media force Steve Bannon. The Democrats’ first point: The margin. Yes, Northam won in a state that’s trending blue, but the final tally was 54 percent to 45 percent. Northam’s nine-point margin of victory is the largest by a Democrat in a gubernatorial race since 1985, when Gerald Baliles captured the governor’s mansion. Since 2000, other Democrats have won governors’ races by about 4 points, 6 points and 2 points. Northam won in a blowout. And his nine-point margin is larger than Hillary Clinton’s five-point win in the state in 2016. That suggests Trump is pushing voters away from Republicans in the state, or bringing out the opposition, or both. Exhibit B for the Democrats is the Virginia House of Delegates. The Democrats flipped at least 15 seats in the Virginia House and changed the balance of power from 34 Democrats and 66 Republicans to almost even, with the results of a few seats still being tallied. The Democrats have not controlled the chamber since 2000, in part due to Republican gerrymandering. The results mark an unprecedented Democratic shift in the makeup of the chamber and they are evidence that Tuesday wasn’t just about Northam or Gillespie, it was about a broader partisan move within the electorate. Third, and maybe most important for the Democrats, some of the demographic splits in the gubernatorial vote were huge and they seem to hold serious warning signs for the GOP. Northam held 20- to 40-point advantages among key segments of the electorate. He won 18- to 29-year-old voters by nearly 40 points, 69 percent to 30 percent. He won college-educated voters by more than 20 points, 60 percent to 39 percent. And he also won the crucial suburbs around Washington by nearly 40 points, 69 percent to 30 percent. That means the Democratic candidate, by wide margins, won the voters of the future, the educated population that used to be a core constituency of the GOP and the wealthy suburban set. That last point, in particular, may give some Republicans real heartburn in the 2018 midterms. Republican struggles in the suburbs are not a new phenomenon. Meet the Press’s Data Download delved into the issue extensively during the 2016 campaign. But the Virginia data shows the party’s problems there might be reaching a critical point. That means there are 54 House seats where the Virginia gubernatorial results could have special meaning. And there are other signs some of them are particularly vulnerable in the Trump era. Hillary Clinton won the presidential vote in 16 of them. In another nine districts Trump won the presidential vote by less than five points. Currently, Republicans hold a 46-seat edge in the House, so a net loss of 24 seats would cost them their majority. So yes, Republicans have some points about the uniqueness of Virginia. And yes, the 2018 midterms are still a year off at this point. And without question American politics has been a remarkably turbulent, messy thing in the past few years. But a close assessment of Tuesday’s results out of Virginia suggests there a few very real reasons for concern among Republicans.